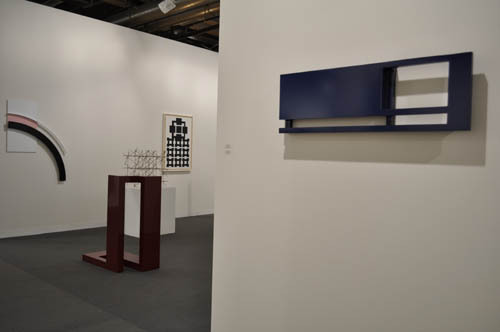 It is with pleasure that we are seeing you to Art Basel again this year. It will be our 44th attendance at the art show, and we are now the only French gallery to have been present at every Basel fair. Furthermore, this year we will be celebrating the 50th anniversary of the Galerie Lahumière. The theme of our stand will be Reliefs and Sculptures and will feature some exceptional works of art. 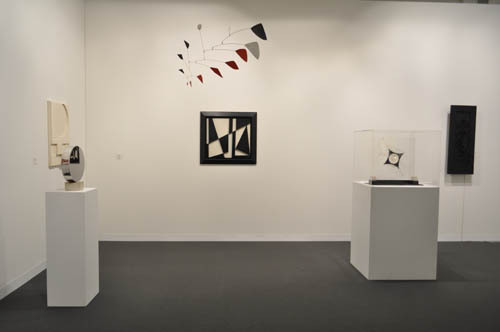 For example, there will be a NAUM GABO sculpture of 1937 that comes from the Gabo estate and that has already been exhibited in many museums ; an ALEXANDER CALDER mobile from a private collection in France ; and a work by Belgian sculptor POL BURY, titled Entité Érectile (circa 1962), with a motor that makes countless white spots move. I will let you discover for yourselves the other artists, whose names I won’t cite here but who were chosen from both the modern school and our contemporary stable of artists. At the gallery we are currently showing works by ANDRÉ STEMPEL, a Swiss artist who has spent his entire career in France and who surprises us once again with his witty pieces—painted in “Senegal yellow” (a type of cadmium yellow), these works intrigue us by their form and their knowing winks. Stempfel, now over eighty years old, is unflagging in his creativity yet his works remain affordable. 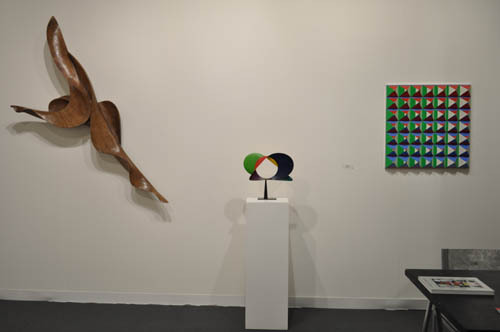 We will be showing several reliefs and sculptures at Basel and are eager to discover your responses to them. 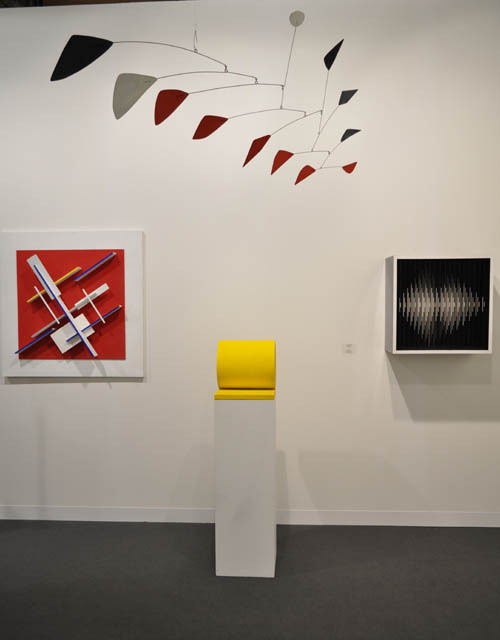 The Dynamo show at the Grand Palais in Paris demonstrates the variety and whimsy of abstract-geometric artists, including not only Victor Vasarely but also Morellet, Kowalski, Yvaral, Gabo and many others. This grandiose exhibition primarily showcases European artists who still represent the leading trend in art that moves, made from various materials. Don’t miss this exhibition, for it provides numerous keys to an understanding of modern and contemporary art while being a very entertaining show. Last week the Pompidou Center thanked Madame Dewasne for her generous bequest of works by JEAN DEWASNE by awarding her the rank of Officer in the Ordre des Arts et des Lettres. Other works were donated to a number of French museums in Cambrai, Le Cateau-Cambrésis, Saint-Étienne, and elsewhere. We are delighted by this decision, because several of these museums will organize events around Dewasne’s oeuvre—institutions have long been far too discreet when it came the work of this artist whom we defended for forty years. A VICTOR VASARELY retrospective will be hosted by the Ixelles Museum (Brussels) from October 17, 2013 to January 19, 2014, then travel to the Haus Konstruktiv in Zurich, while another show is being planned for Finland. Last week Le Figaro newspaper published a long article announcing that “Vasarely gets his color back,” meaning that he is being talked about once again. I would finally like to remind you that the JEAN LEPPIEN show at the Kunsthalle in Hamburg will run from June 16 to September 22, 2013, accompanied by a superb catalogue with numerous essays.